Abstract: We explore nonlinear optical phenomena at the nanoscale by launching femtosecond laser pulses into long silica nanowires. Using evanescent coupling between wires we demonstrate a number of nanophotonic devices. At high intensity the nanowires produce a strong supercontinuum over short interaction lengths (less than 20 mm) and at a very low energy threshold (about 1 nJ), making them ideal sources of coherent white-light for nanophotonic applications. The spectral broadening reveals an optimal fiber diameter to enhance nonlinear effects with minimal dispersion. We also present a device that permits a number of all-optical logic operations with femtosecond laser pulses in the nanojoule range. 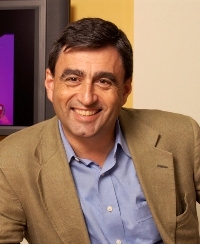 Biography: Professor Eric Mazur is the Balkanski Professor of Physics and Applied Physics at Harvard University. An internationally recognized scientist and researcher, he leads a vigorous research program in optical physics and supervises one of the the largest research groups in the Physics Department at Harvard University. After obtaining a Ph.D. degree in experimental physics at the University of Leiden in the Netherlands in 1981, Dr. Mazur came to Harvard University in 1982. In 1984 he joined the faculty and obtained tenure six years later. Dr. Mazur has made important contributions to spectroscopy, light scattering, and the interaction of ultrashort laser pulses with materials. In 1988 he was awarded a Presidential Young Investigator Award. He is Fellow of the Optical Society of America and Fellow of the American Physical Society, and has been named APS Centennial Lecturer during the Society's centennial year. In 2007 Mazur was appointed Phi Beta Kappa Visiting Scholar. Dr. Mazur has held appointments as Visiting Professor or Distinguished Lecturer at the University of Leuven in Belgium, National Taiwan University in Taiwan, Carnegie Mellon University, and Hong Kong University. In addition to his work in optical physics, Dr. Mazur is interested in education, science policy, outreach, and the public perception of science. He believes that better science education for all -- not just science majors -- is vital for continued scientific progress. To this end, Dr. Mazur devotes part of his research group's effort to education research and finding verifiable ways to improve science education. In 1990 he began developing Peer Instruction a method for teaching large lecture classes interactively. Dr. Mazur's teaching method has developed a large following, both nationally and internationally, and has been adopted across many science disciplines. Dr. Mazur has served on numerous committees and councils, including advisory and visiting committees for the National Science Foundation, has chaired and organized national and international scientific conferences, and presented for the Presidential Committee of Advisors on Science and Technology. He serves as consultant to industry in the electronics and telecommunications industry. In 2005 he founded SiOnyx, a company that is commercializing black silicon, a new form of silicon developed in Mazur's laboratory. Dr. Mazur is author or co-author of 213 scientific publications and 12 patents. He has also written on education and is the author of Peer Instruction: A User's Manual (Prentice Hall, 1997), a book that explains how to teach large lecture classes interactively. In 2006 he helped produce the award-winning DVD Interactive Teaching.